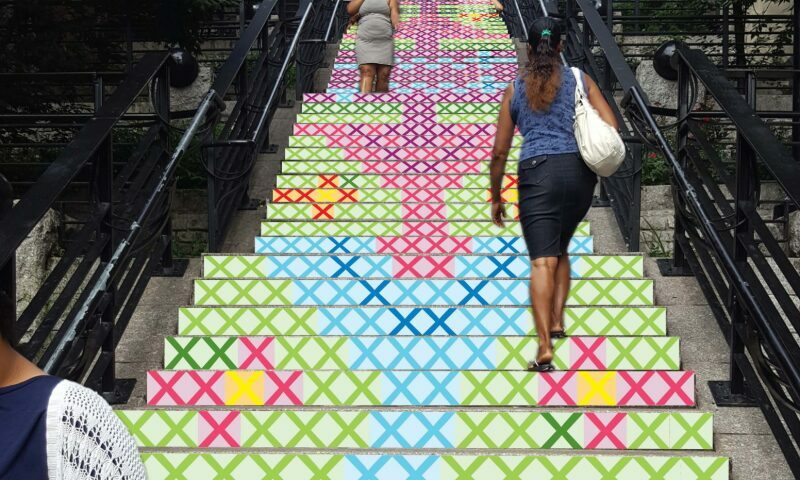 After an extensive, community-based selection process, Bronx-based artists Laura Alvarez and Clark Fly ID have been chosen to install step street murals at two sites in the West Bronx. All paint materials for this project have been generously donated by Liquitex Artist Materials, the first in its field to develop water-based acrylic paints. In August, ArtBridge, working in partnership with the NYC Department of Health and Mental Hygiene, launched an RFP to Bronx artists that resulted in over 50 proposals. A curatorial panel of Bronx arts dignitaries narrowed the submissions to six finalists. At a public event at New Settlement Community Center, Bronx residents voted to select the winners.